As mixed martial arts professionals, Andreas, Khalid and Lom-Ali fight on stage using multiple combat techniques. The film follows the three „modern gladiators“ in their everyday lives and struggles. They fight in cages. Partly because they want to, but also because it’s how their audiences want to watch them. Andreas Kraniotakes, Khalid Taha and Lom-Ali Eskijev are professionals in mixed martial arts (MMA). They fight against each other on stage using multiple combat techniques. They work hard and live ascetically. Their lives are characterised by close friendship, discipline and an unconditional respect for each other and their opponents. Kraniotakes, Taha and Eskijew share the dream of being recognised as athletes and achieving international success. They have to pay a high price for this. 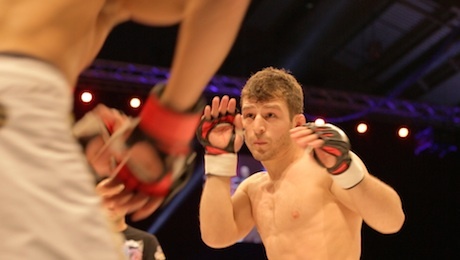 In Germany, MMA fighters are rarely recognised as athletes and barely able to make a living from their sport. The „modern-day gladiators“ are under enormous pressure and can afford neither to age nor get injured – nor can they afford to lose.